Each summer my children look forward to their swimming lessons. They love the water, they love to swim, and the love their teacher, Myrna. She has actually been teaching children to swim for over 50 years, and is the best teacher EVER! I have known Myrna since I was a teenager, and her and her husband are wonderful friends of our family. In fact, she taught most of my brothers and sisters to swim! We are so blessed to have her teaching our own children to swim. When Captain was almost 5 years old, he was not speaking very well at all, and we were looking at the possibility of him needing speech therapy. Myrna heard about this, called me, and told me that she would like to give Captain some private swimming lessons. By the end of the 2 week session, he was speaking. It was amazing. I guess the cross patterning of swimming helps develop the part of the brain used for Auditory Processing. In fact, Captain has been excelling with his tutor this last week and a half and is progressing by leaps and bounds in reading. This afternoon he walked up to me and read me a whole Dr. Seuss book without making a mistake, which is a huge achievement for him. Anyhow, today was day 7 of their 8 swimming lessons. It is also known as "Life-saving Day." Today Myrna worked on teaching the children a swim-survival-safety technique that she has developed over her 50 year career. "It is based on a controlled method of teaching infants/babies to roll to their backs after submersion and to be able to sustain a floating position until help arrives. This bridges the "danger" gap until the baby/child is old enough to learn to swim and take breaths on their own. This method has been credited for saving many toddlers and children's lives around water." The boys had to arrive today, to their swimming lessons, fully dressed (with their swimsuits under their clothing). 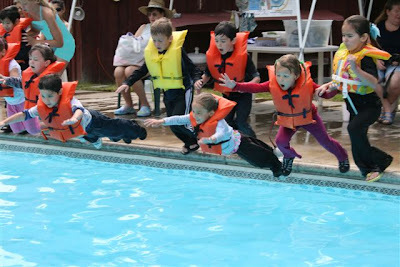 Myrna taught them what they would need to do in the event that they fell into a pool, lake or any body of water. She had the children jump into the pool, and roll onto their back into the "starfish" position. She also had them practice with life-jackets on as well. ...and then how to cuddle to stay warm. They also learned the position to get into to signal "help!" Today she ended the class with a "pony" race. Captain was very excited to finish in 1st place. Twinkle Toes watched intently. The girls will be taking swimming lessons in August, and are really looking forward to it as well. In the meantime, they have been enjoying the pool Snuggles received for his birthday. Too bad Snuggles isn't enjoying it... He likes it about as much as he likes getting a bath -- which is NOT AT ALL!! Thank you Myrna for blessing us with these wonderful lessons. We love YOU!!!! WOW! What a great teacher! Jessica, has Myrna put any of these techniques in writing? I would love to have someone around me teach this to my kids. This is quite a blessing! I just love the photos, you did an excellent job and so did the kids! I love how you caught them jumping in, such intent little faces...learning such important skills. I remember being taught to take off our pants, as they would grad and wiegh us down. Tie each leg in a knot, then take the waist in both hands and throw it quickly over your head, open like a butterfly net. Amazingly, it would fill up with air and you would then squeeze the waist together and use this as a flotation device. It takes a powerful water treader to do all this and we were older...but I still remember it. Love the dive! Could U e-mail me the pic of Captain, I love it!!! And yes Myrna is an awesome teacher!!! A.B. hip hip hooray for them. and yes, myrna is awesome! Wow, that is awesome! I need to get the kids in lessons but the Medford classes are so weird and complicated!! I agree with the other comments. My experiences with lessons have been....well rather dull. Like Sue B. if there are any of these tech. in writing ...boy I would love them also. Unless they are top secret. Again you are lucky. Congrats on the reading! Sometimes it just takes TIME! What a blessing to have your children learn these important skills from such a wonderful teacher! Awesome, what a great teacher!! Yes, she really is a wonderful teacher! Sue ~ I don't think she has any of her techniques in writing, but I will try and ask her sometime. We will be going back in a few weeks for the girls lessons, and so I will make a note to ask her then. Christine ~ Myrna's classes are anything but dull, and my children look forward to it every day!